Q: It used to be easy to replace a light bulb; now there are so many options, I don’t know what to choose. What do you recommend? A: It’s hard to imagine a household commodity that has changed more in the last five years than the light bulb. The incandescent bulbs we all grew up with wasted a lot of energy and have been phased out. Government mandates ushered in the brief reign of the more efficient, but widely despised, compact fluorescent bulbs, or CFLs, which emit terrible-quality light and are difficult to dispose of because of their mercury content. The public’s loathing of CFLs accelerated the development of light-emitting-diode bulbs known as LEDs, which now rule the lighting world. These use up to 80 percent less energy than the old incandescents and can last for decades. LEDs are improving all the time and their prices are coming down. 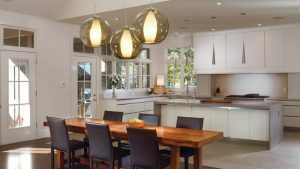 However, the quality of light they produce varies significantly, so it’s helpful to understand some lighting nomenclature before you buy. Most LED bulb boxes have a Lighting Facts label that indicates brightness (measured in lumens), color temperature (labeled K for Kelvin temperature), energy use, estimated energy costs, and expected life. Since most packages also specify the type of incandescent bulb the LED replaces, you don’t need to pay much attention to the brightness measure. Instead, zero in on color temperature: 3,000K is my recommendation for a universally flattering, warm-white light. Anything higher is going to have a cooler, bluish-white cast. Another good measure is the Color Rendering Index, or CRI, which tells you how accurately the bulb renders colors compared to an incandescent bulb, which has a CRI of 100. For LEDs, a CRI of 80 or higher is best. To ensure an LED will fit in your fixture, bring your old bulb with you to the store and compare the bases. The splayed fins that LEDs have to dissipate heat make them larger than other bulbs. Make sure the bulb is dimmable (you may need to replace your dimmer switches with LED-friendly ones to avoid annoying flickering or buzzing). And if you plan to use the bulb outdoors and/or in an enclosed fixture (some LEDs require more airflow than these lights provide), check that these applications are noted on the box.